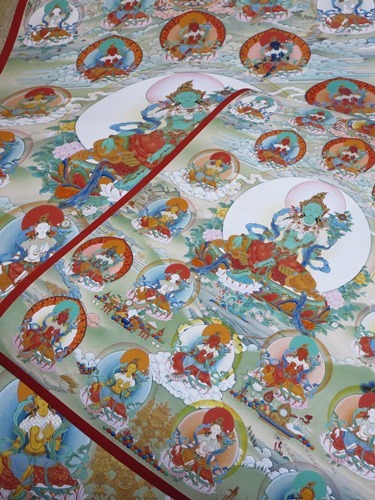 I have been working on producing the replica of thangka of 21 taras in Japan. 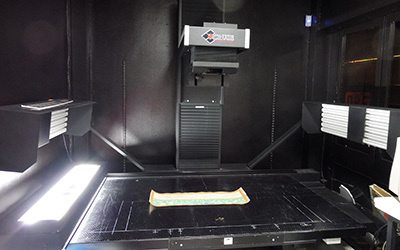 Starting from scanning the thangka with super high definition scanner which I could find only in Japan and correction of the color together with the printing company. All the staffs were very helpful to get the best result despite the busy period of the year. I've just received the sample of the print today. We have made two sizes. 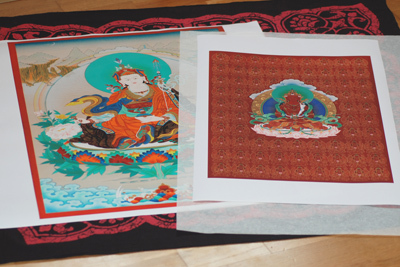 The bigger one is 1165x810mm which is almost the size of the original thangka and the smaller one, 620x431mm. I will write more detail of the process later here but I'm really happy with the result.The DTP operater who helped me did great job. The replica would appear dull and lose the impression if the color is too dark or has not enough saturation, on the other hand the replica would be flashy and lose the depth of the color of natural pigments if the color is adjusted too light. The other important point was the color of gold which is one of thangka's characteristics. In considering these points, we worked together to bring the color close to the original as much as possible. The process of making reproduciotn including the color correction has done very successfully with sharp details and it was greatly thanks to the scanner I used this time. I'm going to write about it here soon. 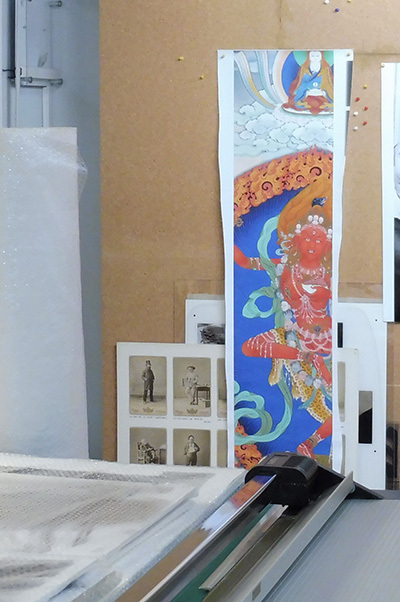 I am making new Giclee print in Japan. "21 Taras" and "Vajra Yogini", "Green Tara" and "Guru Dorje Drolo". Please send me a message from here if you are interested to purchase. I will print it here and bring back to Europe or try to send from Japan if it cost you less for shipping. 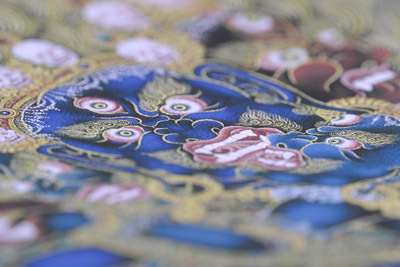 There will be the original size and half size for the reproduction of 21 taras. I'm very excited to see the Japanese technology to create reproduction. I have made the reproductions of the thangka of Vajrayogini, Vajrakilaya and Guru Dorje Drolo so far and I am very satified with these reproductions. Unfortunately it is impossible to reproduce the polished gold part but even very tiny details and fine brush stroke are visible. 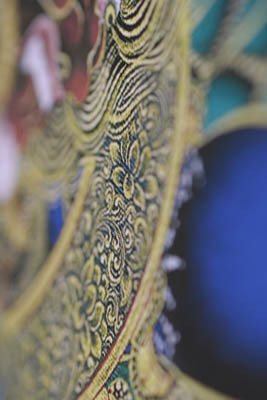 The following images are the printed images of Vajrakilaya reproduction. 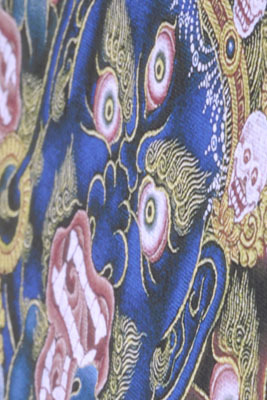 We can even see the texture of the canvas of original thangka. 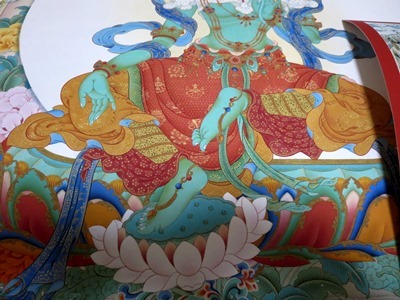 And this time I have made the reproductions of 2 more thangkas. Guru Padmasambhava and Amitayus. 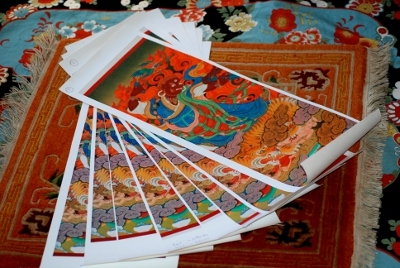 To reproduce the tiny details and fine lines of a thangka, we need an image of very high quality and the color adjustment for actual print is one of the most important and difficult part. 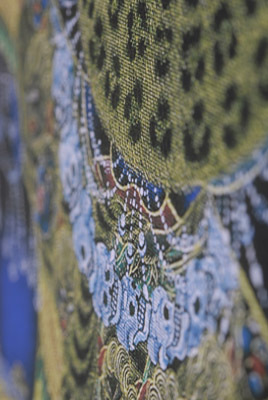 We bring the color of the prints as close as possible to the color of the original painting by repeating many of test prints and color adjustment. The recognition of our eyes are very unreliable. It is asily effected by other colors in the same paint. Our eyes(or brain) recognize the color very differently by the contrast with the other colors beside. The condition of the light is also very important. If it's indoor, then we must consider the color or type of illumination. 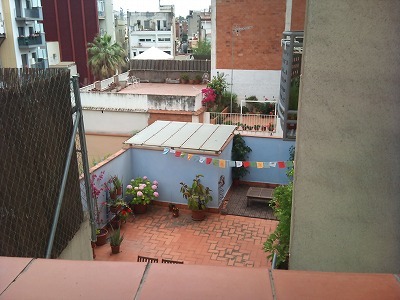 Or if it is outdoor, the light of the sun also changes very much depend on the time. Sometimes we see a color of the print is lighter than the original indoor, but then when we check them outdoor it can be opposit. 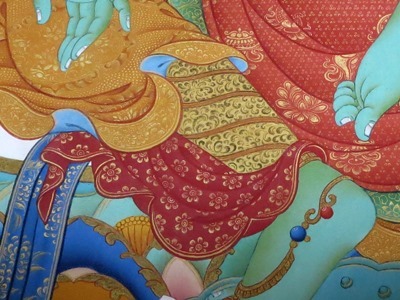 I'm not sure but maybe it happens because of the defference of the pigments I use to paint thangkas. I'm very happy with the result of the reproductions this time again. And I am particularly happy to be able to produce the reproduction of the thangka of this Padmasambhava. 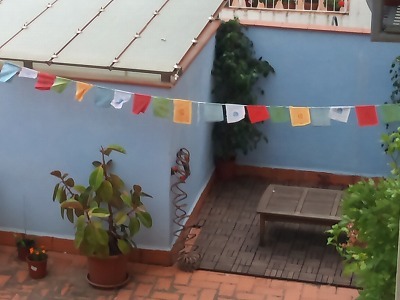 This thangka brought me wonderful news and also good connections with many nice people. 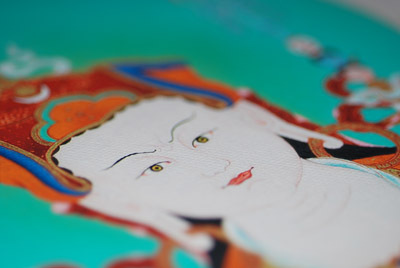 I've made Giclee reproduction of the thangka of Guru Dorje Drolo. The color which we see of the digital images are very much depending on the setting of the monitor. Also the actual color of the printed images are very much depend on the setting of the printer, on what it's printed(paper,canvas etc) and the type of the ink,,,,etc,,,etc. So it is quite difficult to make good color reproduction. We had printed many of proofs to check the color. The printer said 2 or 3 times proofs would be enough but finally they had to print 10 proofs to get good result. They said printing on paper is better for the small details but I still chose the canvas so that it can be framed in traditional Tibetan style with brocade and can be rolled.